In the weeks leading up to Thanksgiving, and hubby still unemployed, I wasn't sure how I was going to make a traditional holiday dinner for our large family. Thankfully, turkeys always go on sale 40-70% off for the holidays (like .49 cents a pound). I never purchase the more expensive top name brand (also on sale, $1.19 a pound) because I almost always use an oven cooking bag and they turn out moist and delicious every year. So, on Sunday I went to the grocery store and picked up my off brand sale turkey and put him in the fridge to thaw, for the next four days. Oh, right, I forgot to mention, I've been under the weather so I wasn't really paying attention to the sizes. Somehow, I managed to bring home a 20 POUND bird!!! Here is the first new recipe we came up with for this year, and I know y'all will love it! It was my husband Wayne's idea and it was quite good. In fact, it was so good, he wants to use up ALL the leftover turkey the same way. I'm hoping we get a chance to try some other recipes though, I'm sure y'all have many great ideas too! Toss shredded turkey together in a medium size bowl with barbecue sauce. 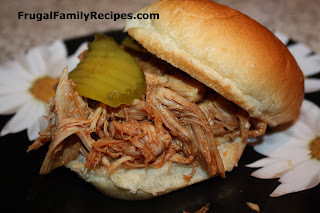 Place pulled turkey on buns and top with pickles if desired. Or, serve with vegetables or other side items instead of a bun for a barbecue "plate."